You can be the parent God wants you to be: loving, encouraging, trusting and able to raise up your children in the way they should go, fulfilling their own unique destinies. Parenting was not intended to be a burden, and anyone who tells you differently has bought into a lie. You will learn to enjoy parenting as an exciting, joy-filled, divinely-ordained opportunity, not a wearying responsibility. Let God's Grace Flow Through You to Your Children! "God has a vast reservoir of grace that He wants to pour into your life, your home, and your family. And He has provided lots of ways by which that grace can be channeled through you and into the lives of your children. Unfortunately, these rivers of God's grace can become littered with the debris of our own sinful thoughts and actions, as well as the ungodly actions of our ancestors, creating dams that prevent His grace from flowing the way He desires." What Makes This Parenting Package So Unique? Succeed at home where it counts by becoming a skilled, anointed parent! Emphasizes releasing God's grace into the lives of your children. You discover ways to allow God to mold them from within. You focus on their hearts more than their actions. You speak life over your children. You learn to hear from God before you speak or act. You learn how to apply the Golden Rule toward your children. You bring your Christianity into your home. Trains you to focus on your children's strengths, rather than their weaknesses. You learn how to discover what your children's strengths and gifts are. You know that the cultivating of these unique gifts prepares each child for success. You don't need to feel guilty for not taking on other ministries outside the home while you are raising your children. You minister the Christian virtues of love, gentleness, patience and honor within the home, toward your children. You are discipling the next generation of Christians in the best possible way. Your children will be able to hear God's voice every day. They will learn to live out of the voice of God within, preparing them for a life of success! You see God's love, forgiveness, and gentleness toward you and you extend that toward your children as well. You recognize we are all God's children. You speak only life over your children (Prov. 18:21). 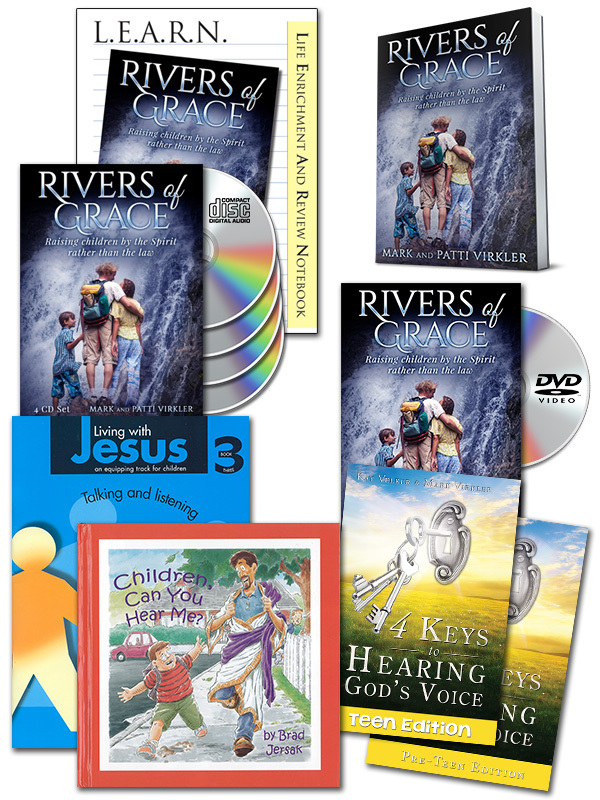 The CDs and DVD correspond with the book, Rivers of Grace and LEARN Rivers of Grace notebook. For maximum growth and internalization, we recommend utilizing them all together. One copy of the book per family is fine, and one LEARN notebook for each individual is recommended. The LEARN notebook provides an outline to follow as you watch the DVD sessions and listen to the CDs. Also included are application exercises and classroom activities. Become the World’s Greatest Parent Package Includes ALL These Amazing Resources! Details of Each Item Included in the "World’s Greatest Parent Package"
In Rivers of Grace you will discover how to release the power and wisdom of God into your children's lives; how to remove generational sins and curses; how to teach them to have a heart after God. You will look at your own relationship to your parents to be sure you are honoring them as you should. You will learn what it means to honor your children, for the Bible says we are to honor ALL people and this includes children. You will learn to watch your mouth, and speak only life over your children. You will not speak negative words which hurt and crush their spirits. You will learn to focus on their God-given strengths, rather than their weaknesses, for it is the strengths which God has placed within them which allow them to ascend to success. You will learn that your number one ministry during the years you are raising your children is to minister God's life to your children! So you will make them your number one priority without feeling guilty about it. You will learn why it is vital to teach them to hear God's voice for themselves, and how to make wise spiritual decisions by using God's approach to decision making. Once you read this, I believe you will agree that it should be required reading for all parents, and it will serve as a tool helping them succeed in the most important ministry God has given to them, raising their children up in the Lord! Purchase this and pass it out as birthday and Christmas gifts to all who are raising children and "Congratulations!" gifts to new parents. They will love and thank you from the bottom of their hearts! These are ideal for repetition and review as you drive, work or exercise. Hearing Patti teach this series releases an impartation, revelation and spiritual understanding which, if internalized, will completely transform your life. Patti shares from her own story of raising two children. Every time you review this series the Holy Spirit reveals more to you. Do yourself a favor and listen to them over and over until the revelation is complete. Rushing on to another topic without internalizing this truth does not result in cultivating Christian spirituality. Introduction & Godly Heritage 39 min. What Is Your Goal? 66 min. Golden Rule & Respect 31 min. Watch Your Words 15 min. Focus on Strengths 50 min. These teaching videos focus on the PowerPoint slides as Mark and Patti teach, giving you the chance to take careful notes and really grasp what is taught. Hearing Patti teach this series releases an impartation, revelation and spiritual understanding which, if internalized, will completely transform your life. Patti shares from her own story of growing in grace by raising two children. Every time you review this series the Holy Spirit reveals more to you. Do yourself a favor and listen to them over and over until the revelation is complete. Rushing on to another topic without internalizing this truth does not result in cultivating Christian spirituality. The seminar guide/notebook also gives you an opportunity to easily preview and review the teaching. None of us catches everything the first time through and as you review it several times, you will pick up things you did not hear before. More truths will begin to "click" and more lights come on! Application exercises are included in the seminar guide/notebook for class times and for increasing personal revelation at home. Hearing a truth is one thing. Letting God speak to you concerning how to apply it in your life is another. These application exercises will give you the opportunity to seek God and ask Him what He wants to say to you concerning the truth, and how He wants to see it applied in your life. This is exactly what you need to hear and act upon. This is spiritual growth and development. Please review our short article on "How to Cultivate Christian Spirituality." Turn teens on to hearing God's voice, two-way journaling and receiving divine vision! Keep them from going through teenage rebellion by teaching them how to hear from the Lord personally every single day of their lives. Give them a foundation that will let them accomplish more than they ever dreamed possible! This book covers not only the four keys to hearing God's voice, but also salvation, the place of the Bible, Spirit-filled living and more. The adult-level 4 Keys to Hearing God's Voice message is rewritten with pictures and language which is more appealing to teenagers. Suggested ages: 11 -14. Other book versions of these four keys are available for 4 - 8 year olds and 8 - 11 year olds. Why not train God's children of every age to hear His voice? Mark Virkler taught his daughter Charity how to recognize God's voice when she was just 8 years of age, and two-way journaling has been an important part of her life ever since. Their son Joshua also learned to hear from God as a child. How rewarding it was to see them alive for Christ, especially through their teen years! And how blessed Mark and Patti are to have both of their children actively involved with them in ministry! This powerful book teaches children ages 4 - 8 the four keys to hearing God's voice and gets them started journaling (drawing pictures if writing is too difficult for them) and seeing vision. It is ideal for parents and children to use together, or for use in a children’s Sunday school class or children’s home group. Children, Can You Hear Me? This delightful book illustrates in full-color how God opens the eyes and ears of each child's heart so that they become aware of His constant love and friendship. Speaking in the first person, God assures the reader that He is available to them wherever they go and through every experience. This book brings journaling, seeing with the eyes of your heart, dream interpretation, inner healing, and trusting God in all of life to the youngest child. We cannot recommend it too highly! Following the children's story, the author has included a chapter for parents, suggesting a variety of spiritual exercises that will nurture child-like faith. Who knows…as you disciple your child in these exercises, you might even find yourself growing stronger in faith! Gina Burmeister developed this booklet to teach the four keys to hearing God’s voice to pre- and early teens. She teaches at-risk inner city kids how to hear God’s voice and rejoices to see God take head knowledge and turn it into heart revelation through living, two-way relationships with the children. She meets with them at McDonald’s, at picnic tables, her own vehicle and wherever she can. Gina' ministry was birthed out of the voice and vision of God. You can read her amazing story as well as find many more examples of children’s journaling and pictures here. "I’ve recommended Rivers of Grace to every parent I know, as it is the BEST book on discipling children that I’ve ever read. Thank you!" "I find such freedom in your book. I wish that I had had more of this type of training when my children were younger. I must tell you that a lot of the child rearing out there, even though it claims to be Spirit-led, is simply sophisticated ways of manipulating behavior. We need more things like what you’ve written here! God bless you." "After only reading the first two chapters I know my life is being changed. Your book has been the first step God is using. I wanted to let you know right away, that your book is inspiring me. Thank you so much." "The book was written in such a simple, clear way that any of us could understand the principles and put them into practice. "Although I am a grandmother and am past raising children I found this book to be an excellent example of a woman who went against the 'normal' stream of society, and did what she felt the Lord wanted her to do for her children. She teaches and encourages through God’s Word and His principles, how to be the Mom (parents) we were called to be. I consider this to be an excellent book for all parents as well as educators." What an awe-inspiring, uplifting and encouraging word of God: Not only the need to raise up children to love, serve and follow God’s leading, but how to accomplish this seemingly impossible task. Has God called you to homeschool your children? Here are words of wisdom, guidance, and understanding to help parents, grandparents, aunts and uncles, and close friends to understand and support the principles of homeschooling based on God’s word. Read how to(s) for praying and encouraging yourself, your family and your children to live by the Spirit rather than by the law. This is a book to be read by all Christians who are called to minister and serve in God’s Kingdom, for are we not all children in God’s eyes? Are we not called to be spiritual parents, brothers and sisters? We must all come to God with a child’s faith and grow into His love and grace as a child. What wonderful, easy-to-follow principles that can be applied to our own lives and to all of God’s children, regardless of age or parentage. "It is definitely a book that I would recommend people read, whether single, married, with children or expecting a child. If someone hasn’t heard about the topics discussed in your book, they need to! The book helped to dispel some beliefs I had previously held, and caused me to go to God and ask Him what He thought about those things, which I think the book communicated really well (not a bunch of rules, but relationship!). I thoroughly enjoyed it!" I have been a public school teacher for many years and have also worked with many church youth programs. In Rivers of Grace, I recognized many principles that will aid in seeing and hearing the voice of God myself and working with youth of all ages to hear God’s voice. Patti has truly shared God’s word. She shows how each of us is able to move from the rules and law as described in Scripture to God’s grace. It is this grace that really far exceeds the rules and laws we so often rebel against. Patti’s emphasis is on raising children for the Lord and homeschooling. But are we not all children that must learn the same lessons? I believe that God is busy homeschooling His children every day, teaching and guiding us to listen to His voice and learning to abide in Him. We are all in the process of learning and teaching. May we all continue to have a child-like faith that believes that all is possible, and know that God is indeed the Answer. Teaching children at home is now a wave in the U.S. according to this article. Homeschooling enrollment is growing seven times faster than public schooling enrollment. Wow! How is this for a return to God's mandate that parents are to train up their children (Eph. 6:4)! From Pastor Lackson Banda, South Africa – For the first two years of my older children’s lives I was an absent father due to ministry work. I have 3 kids, 2 boys and 1 girl. The first one is son 11 years, the second girl 8 years and the 3rd is boy 4 years old. They all have different personalities. Each one provides their own specific challenges to my wife and me. This is an exciting occasion: Bekah and Jasmine, our 5 and 7-year-old granddaughters, have begun journaling! What a joy for grandparents! So of course, I need to post their first entries so you all can celebrate with me. Bekah's is first, followed by Jasmine's.